Materials of this chapter were published in the article: T.A. Ryabchinskaya, N.A. Sarantseva, G.L. Kharchenko, I.U. Bobreshova, A.K. Zlotnikov. The tactic of using polyfunctional biostimulant Albit on oats // Saharnaya Svyokla (Sugar Beet). - 2013. - № 6. - P. 36-44. About the effectiveness of treatment with Albit to reduce mycotoxins content see also article: A.K. Zlotnikov, K.M. Zlotnikov. Influence of biostimulant Albit on oats contamination by mycotoxins // Zemledelie (Agriculture). - 2013. - №5. - P. 41-44. Stable positive reaction to the biostimulant Albit is typical not only for grains (wheat, barley, rye), but also for paniculate cereals (sorghum, millet, rice, oats). Albit has been tested and applied on oats since 1998 in Bryansk, Vladimir, Voronezh, Ryazan oblasts and other regions (see Table). Increase in yield of oats under the influence of Albit ranged from 7.5 to 22.3 %, or from 0.4 to 0.6 t/ha with a control level of 1.9-5.5 t/ha depending on the year, method of treatment and region. On average, the treatment with Albit increases the yield of oats by 15.7 % (0.46 t/ha). The high economic efficiency of Albit on oats was shown. Recoupment of Albit application on oats was from 3.5 to 7.3 times (profitability - 260-635 %). Each liter of Albit provides additional yield on average 19.2 tons of oats. One liter of Albit is enough for treatment of 41.7 hectare at a rate of 20 mL/t seed + 20 mL/ha. Method of application. 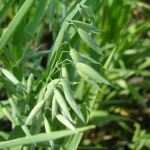 On oats pre-sowing seed treatment and spraying at the tillering stage, with application rate of Albit 20 mL/t and 20 mL/ha are recommended. Fig. 1. Seed treatment with Albit promoted to enhanced development of root system of oats, and also more friendly and uniform germination. Left – variant with Albit treatment, right - variant with standard treatment (Magdeburg, Germany, 2012). Treatment with Albit allows effective prevention of infectious diseases (leaf rust, red-brown blotch, Septoria leaf spot, and root rots of various origin), increased flag leaf growth and photosynthesis efficiency, accelerates phases of growth, enhances the resistance of plants to heat and drought. Some effectiveness of Albit against insect pests was shown (flea beetles, wheat leaf-miner, corn-flies). Sprayings with Albit should be combined with the planned application of herbicides, fungicides, insecticides and liquid fertilizers. Field trials of many years showed that oats grain (compared with other cereals) has the highest concentration of harmful compounds - mycotoxins. Therefore the impact of treatments with Albit on mycotoxin content in oats grain was evaluated. It was found that Albit reduces crop infestation by major mycotoxins deoxynivalenol (DON), T-2, NT-2, ochratoxins. On the aggregated data we can conclude that the best rate of Albit is 20 mL/t (ha), since increasing the level of all of the examined mycotoxins has not been observed. In an experiment conducted in 2011 reduction of mycotoxins content under the influence of Albit was approximately 25 % (with higher content of mycotoxins in control), in 2012 by 40-60 % (with lower content of mycotoxins in control). It was found that Albit at the recommended dosages is able to reduce the content of mycotoxins. It is important due to chemical pesticides often have a negative impact on the content of mycotoxins in grains (for details click here). On oats Albit is applied as antidote for reducing of phytotoxic effect of pesticides. Also Albit increases germination, activates growth and development, increases resistance to unfavorable climate conditions, improves yield quality, decrease content of mycotoxins in crops. Our product also increases resistance to diseases. In the following Table, you can see all reports on performance of Albit on oats, available in English. For all available reports, please see corresponding table on Russian webpage. 1. Ryazan oblast Plant Protection Station in Ryazan oblast 1998 The field trial was conducted at development and production farm «Aloshenskoe». Albit was used for presowing seeds treatment with an application rate of 30 mL/t. The area of the experimental field was 39 ha, control field area was 47 ha. The herbicide on the base of tribenuron-methil was used. Yield increase under the action of Albit was 21,2 % or 0,41 t/ha (2,34 t/ha for Albit application, 1,93 t/ha for control). Albit also protects plants against infestation by root rots of different origin. 2. Bryansk oblast Agricultural production company «Krasnyi rog» 2004 The field trial on Albit efficiency was conducted in duplicate – experimental fields area were 50 ha; control fields areas were 30 and 50 ha. The average yield increase was 0,6 t/ha or 22,3 %. In the field trial Albit was used for presowing seeds treatment and at the tillering stage (application rate of 10-100 mL/t (ha)) in conjunction with the herbicide tribenuron-methil for oats variety "Skakun" (“Racehorse”). The optimal application rate was 20 mL/t (ha) for seed treatment and foliar sprayings. Yield in the variant with double treatment with Albit with an application rate of Albit (20 mL/t (ha)) was 40.4 t/ha. Yield increase was 4.9 t/ha or 13.8 %. Recoupment of expenses was 7.3 times, and the margin was 571,7 %. Under the influence of Albit the area of the flag leaf was significantly increased up to 120 % over control (111 % of bio standard). Biological effectiveness from red-brown blotch and Septoria was 40 % (14 % of bio standard). In small plot experiment (size of plots 5 m2) Albit was used for treatment of oats variety "Lion": presowing and foliar spraying at tillering stage together with herbicide tribenuron-methyl at a rate of 10-100 mL/t (ha). The optimum application rate of the biostimulant Albit is 20 mL/t (ha). Yield increase at such application rate is 7.5% (control 3.6-5.5 t/ha). Albit significantly increases photosynthetic efficiency up to 109.4% over control (97% - biological reference product). Biological efficiency of Albit against red-brown spot and rust was 27.3% (18.2% biological reference product). A certain efficiency of Albit against pests: 70% - grass flies (Chloropidae), 27% sunn pest or corn bug (Eurygaster integriceps), 52% grass-miner moths (Agromyza ambiqua), 71% of flea beetle (Alticini) was shown. Profitability of the double application of Albit in a dose of 20 mL/t (ha) ranged from 248.5 to 286.0%; return on investment - from 3.5 to 4.9 times. 5. Vladimir oblast Plant Protection Station in Vladimiroblast 2012 The field experiment was carried out at the Agricultural production company "Karabanovskiy". Oat variety “Skakun” (“Racehorce”) in a mixture with peas variety “Nikolka” was sown on an area of 50 hectares. Seed treatment was performed with consumption rate of Albit - 40 mL/L. The yield of green mass in the control was 11.3 t/ha. Treatment with Albit contributed to the increase of the yield of green mass of 1.1 t/ha or 9.7 %.